In July 2005 I was awarded the "Master of Science (MSCi) in geology" with 1st class honours. The success of the master's project and my continuing interest in mineral exploration inspired me to leave Europe and undertake a Ph.D. thesis with MDRU at The University of British Columbia, which commenced in January 2006. The Ph.D. project provided me with a first opportunity to work directly with the industry during the field season in 2006. In addition to my academic studies at Galore Creek I was employed by NovaGold Resources Inc. and actively took part in their exploration program. This provided valuable experiences in the economic application of exploration geology. In the future, it is my aim to become an active member of B.C. 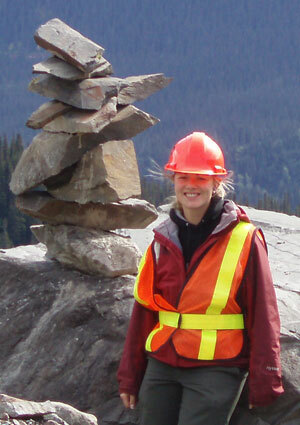 's mining industry either as an exploration or research-oriented geologist. Alkalic porphyry deposits are typically enriched in Au, Ag, and Cu and can have large tonnages either in one deposit or on the district scale, which makes them economically attractive. Despite their attractiveness the deposit type is poorly studied and its characteristics little constraint. Unlike the more common calc-alkalic counterparts, the hydrothermal footprint of the alkalic porphyry deposits lacks a large scale and distinct alteration zonation, which hinders exploration. Galore Creek is unusual as the common widespread potassic alteration zone (10s of kilometres in extent) is overprinted by intense calc-potassic alteration and surrounded by a peripheral propylitic and weakly developed phyllic alteration halo. Within the potassic alteration zone, ore distribution and mineralization style differ widely. Chalcopyrite and bornite predominate in the gold rich northern and southern portion of the Central Zone (North and South Gold Lens), where they are principally disseminated. In contrast, chalcopyrite is most common in the central portion of the deposit (Central Replacement Zone), where it is disseminated as well as fracture-infill and breccia cement. The difference in alteration and sulphide mineral distribution requires investigation if we are to comprehend the controlling factors behind their spatial distribution. Subtle changes in sulphide and silicate compositions record the evolving fluid character during the life of the hydrothermal system. Understanding the hydrothermal evolution of this deposit will provide a critical constraint on alkalic porphyry systems. Such constraints form the basis of any exploration model and might find direct application on other members of the deposit type found primarily in British Columbia and New South Wales, Australia. My Ph.D. is part of a joint project between MDRU (Mineral Deposit Research Unit, UBC) and CODES (Centre for Ore Deposit Research, UTAS). It is sponsored in part by Geoscience BC, Novagold Resources Inc., NSERC as well as various other members of the industry.